Free Jiu Jitsu self-defense class. Jiu Jitsu self-defense is for everyone. kids, teens and adults. Whether you’re brand new or have been training for years, we offer kid and adult classes for all skill levels. Kids Jiu Jitsu focuses on standing and ground self-defense for school yards and neighborhoods. Adult classes focus on self-defense for real life situations. Ryan Deichert, Owner and Gracie 3rd Degree Black Belt, has been teaching students for over 20 years and is dedicated to sharing the authentic Gracie System that the late Grand Master Helio Gracie created. Our Gracie Jiu Jitsu Basics Program is safe, energetic and, by far, the best way to get started in the most effective martial art in the world: Brazilian Jiu Jitsu. There’s no hard sell, no future obligation. 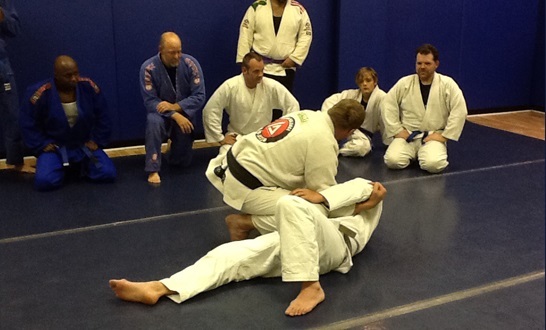 Simply come in for a free Brazilian Jiu Jitsu class and we’ll show you why BJJ is the best self-defense martial art. Give Ryan a call or fill out the form for a free jiu jitsu class. We’ll email you the beginner’s guide with everything you need to know for your first class.